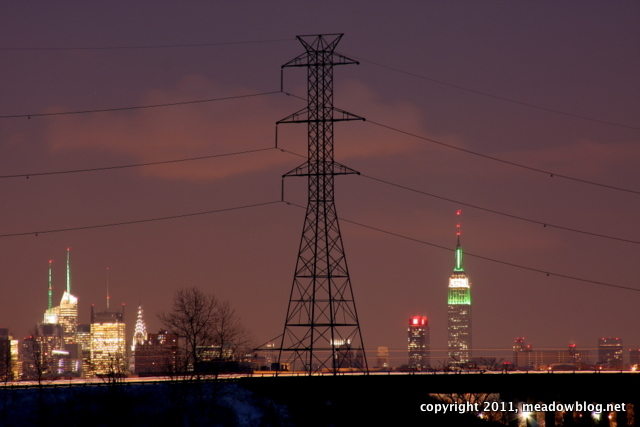 In honor of the Meadowlands' Jets team and in anticipation of the 2014 Super Bowl at the New Meadowlands Stadium, we had to share this shot of the Empire State Building (right) tonight, lighted in green in honor of a local pro football squad. This photo was taken from DeKorte Park. Hard to believe, but Super Bird Sunday II is 16 nights away. 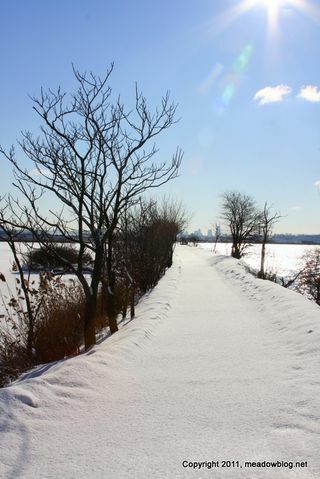 If you like snow, DeKorte Park should be a great place to visit this weekend. A blanket of several inches covers the park, and the Canvasbacks, Ruddies and other ducks have congregated along the shoreline of the Saw Mill Creek Mud Flats. 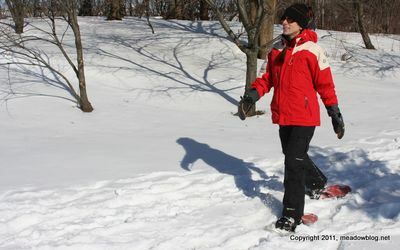 You can cross-country ski in the Lyndhurst Nature Reserve and go snowshoeing almost anywhere. Just remember to dress warmly and stay dry — the weekend forecast is for cold weather, and the winds of the Meadowlands can make it seem even colder. 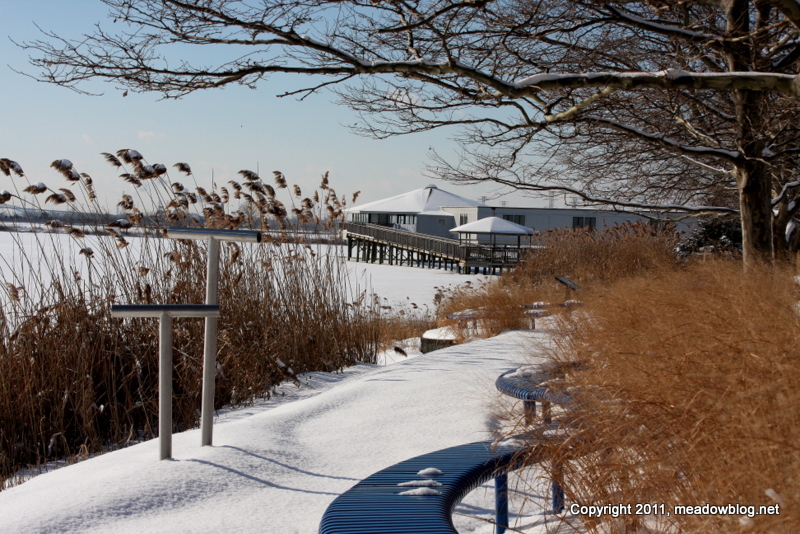 A free winter bird walk is scheduled for Sunday at 10 a.m. (see below). See you there. With the Rough-legs making almost daily appearances on Disposal Road, we added a free nature walk for this Sunday, Jan. 23, at 10 a.m. at DeKorte Park. 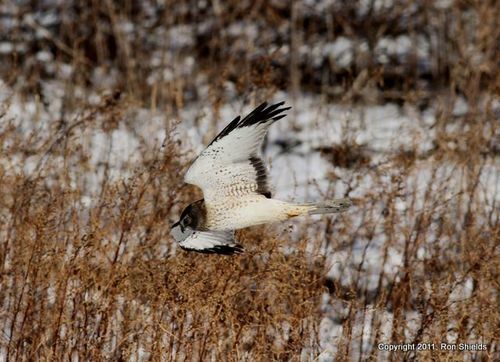 We'll check Disposal Road for an array of raptors, from Rough-legs to Northern Harriers (like the Gray Ghost, above, photographed last weekend by Ron Shields) to American Kestrels — and we'll look for ducks as well. The walk is brought to you by the New Jersey Meadowlands Commission and the Bergen County Audubon Society. The Rough-leg at left, photographed earlier this month, is a frequent flier — we can distinguish it by the missing tail feather. 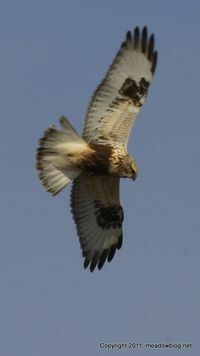 Stay tuned to this blog for the latest Meadowlands raptor sightings. Details follow. The challenge of winter for me has always been the cold and snow limiting my outdoor activities and causing me to hibernate. This does not bode well for my love of nature and the outdoors. A close and wonderful nature fix for me is DeKorte Park. Not wanting the cold and snow to limit me, I ventured there after the last blizzard, trudging around almost knee deep in snow. I ran into someone out on cross-country skis and was immediately inspired. 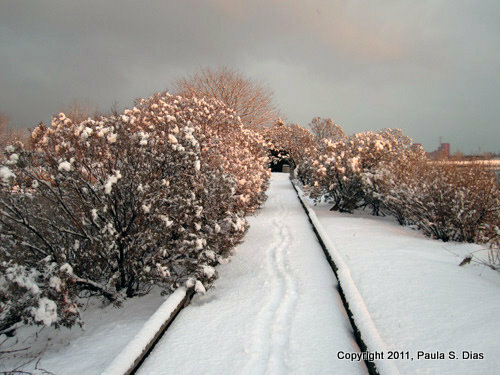 The next day I dusted off my snowshoes which had been collecting dust for a couple of years. Dressed warmly head to toe in my snowboarding gear, I headed out. F reedom! 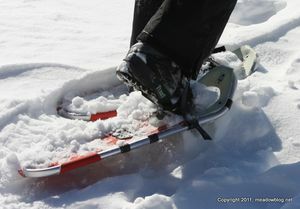 The snowshoes made walking atop three feet of snow a breeze. I could go virtually anywhere I wanted with ease and it was fun not to feel limited. It was a whole new world. 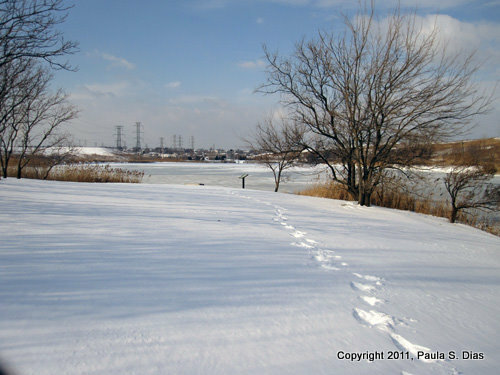 With my pocket digital camera I photographed untouched snow-covered beauty (photos top and bottom). And what great exercise! It certainly beats being stuck indoors walking on a treadmill. I enjoyed the beauty of the icy white landscape and the company of myriad waterfowl, hawks, and other rare winter visitors like the White-crowned Sparrow. No need to drive an hour to enjoy this fun winter sport, I discovered I could do it right here at DeKorte Park.